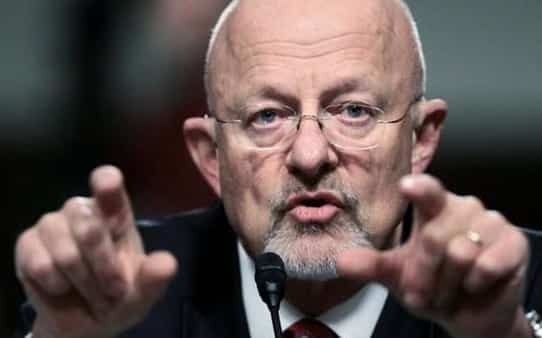 James Clapper, former director of national intelligence, said the 1970s Watergate scandal “pales” in comparison to the current investigations looking into President Trump’s possible collusion with Russia. Clapper made the remarks during a speech to Australia’s National Press Club on Wednesday. “I think you compare the two, that Watergate pales, really, in my view, compared to what we’re confronting now,” he said. Clapper also said it was “absolutely crucial for the United States, and for that matter for the world, for this presidency, for the Republicans, for the Democrats and for our nation at large, that we get to the bottom of this.” Trump’s firing of former FBI Director James Comey was also “egregious and inexcusable,” Clapper said, adding that reports of Trump sharing intelligence with the Putin regime are “very problematic.” He also disclosed that Trump asked him in early January to publicly debunk the findings of U.S. intel community report that Russia had meddled in the election. “Ever transactional, he simply asked me to publicly refute the infamous dossier, which I couldn’t and wouldn’t do,” Clapper said. This entry was posted on June 7th 2017 at 4:38pm/16:38 and is filed under Elections, Live News Column 2, Politics. You can follow any responses to this entry through the RSS 2.0 feed.